This fall, the kiddo transitioned to kindergarten. Some moms cry at the school bus stop, I cry over the school lunchroom. While I could easily whip up sack lunches that would best the single entrée of “Hot Dog Tacos” or mystery casserole at the private preschool, now I was up against an entire lunchroom with FIVE choices daily. Choices that always involve some type of “kid food;” pizza, nuggets, hot dogs, burgers. And sugary flavored milks, froot snacks and chips for sides. While the endless justification of sack lunch was wearing on me, I never realized just how hard it was for her — until I ate at school one day. It was after a field trip. If you’ve never been on a school bus with fifty kindergarteners, two words of advice: Ear. Plugs. Prison riots are quieter. My ears managed to survive, but I have to confess even with a second mom along, she and I were constantly counting heads and wondering where the fifth kid was off to. We did manage to get them all back to school, in one piece and with pumpkins. Success. Note to self: Always go on school field trips. Bring earplugs. Equip children with tracking devices. Gratefully off the bus, the kiddo and I held hands on the walk to the lunchroom with our shared sack lunch. She was so excited to have me there. (Yeah, I know, enjoy that while it lasts, right?) We sat with some of the other parents and kids. They all had the school lunch of the day; hamburger or hotdog, potato chips, a discarded bag of plain, raw carrots, chocolate ice cream, and chocolate milk. As I sat there, wondering what kind of USDA guideline blesses that as a balanced meal, I realized something. My kid has to sit and eat her healthy meal while other five-year-olds eat ice cream and chocolate milk in front of her. Daily. She must think I am the Evil Health Food Nazi Incarnate. When I looked over at my kiddo, she was happily digging into her cottage cheese and apple sides. She raised the container to show the others at the table, “I have HEALTHY food! !” she exclaimed. Needless to say, the looks on all the parents’ faces, including mine, were surprised. This is definitely not my every day experience. Note to self: Buy lottery ticket. Sure, it’s not exactly real nutrition science there. And between you and I, broccoli has nothing to do with big biceps. But the lesson is present: good food makes a strong body. And as much of a struggle as it can be — oh, can it ever be — to keep your kid’s diet even eighty percent good, these moments make it worth doing all over again. Okay, maybe not the bus ride part. • Understand that you are not going to win every battle. Just hold the battlefront to that “eighty-percent-good” line. Some days you will win at this, some days you won’t. You are trying, and that worth a medal alone. • Pack lunches the night before so you are not grasping for ready-made food “products” as a quick solution in the mornings before coffee. Give yourself every opportunity to succeed. Leftovers from dinner often make great lunches, too. • Some times, put a few vegetables into the box even if you don’t think they will get eaten. Kids need to get used to the idea of a balanced meal with a lot of colors. • Since most flavored milks have as much sugar as soda, it’s okay to say no to these. And it’s okay to tell your child why you are saying no. • Show your muscle. However you teach the lesson to your child — books or biceps — teach him or her about the relationship between food and health. It’s as important as reading and its definitely not being taught in the school lunchroom. • Don’t overwhelm yourself trying to make special lunches daily. Simple things like using a cookie cutter to shape a sandwich are often enough to make a lunch appealing for the tough cases. Besides, it’s not like the stuff they are serving at school tastes good — remember school lunch? Shudder. Your plain turkey on wheat is better simply because it is real food. • You might have to meet your kid in the middle for a while. 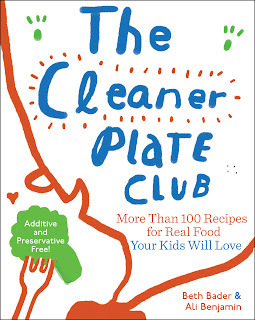 Think homemade pizza on a wholegrain crust, a black bean burrito, or the healthy chicken nugget recipe from our book. You can take the junk out of these foods. • When it seems like a losing battle, read the ingredients in what that lunchroom serves as “food.” That should keep you motivated. Or give you nightmares. Beth Bader has been a photojournalist, writer, and shark wrangler. As much activist as cook, she is, most of all, a mom determined to make the world a better place for her child, one meal at a time. She is a food blogger at Expatriate’s Kitchen and contributes to EatLocalChallenge.com and EatDrinkBetter.com. Beth lives in Kansas. Love your post. I really like. I'm glad I dropped by here, I learned new things and techniques. This will be very helpful. In addition, pack lunch container should be 100%BPA free, durable and eco-friendly. So that kids would love to eat more. Because other container taste like plastics.